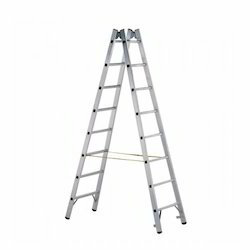 Prominent & Leading Manufacturer from Secunderabad, we offer aluminium single ladder with rungs, 2 part push-up and rope-operated ladders, 2 part push-up and rope-operated ladders - frp, aluminium platform ladder, double-sided stepladder with rungs and height-adjustable stepladder with rungs. 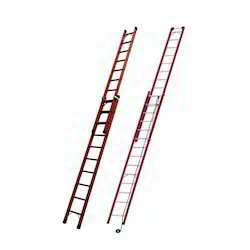 Minimum ladder width 420 mm & Pitch: 280 mm. 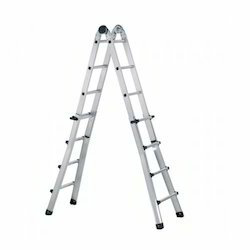 Our range of commercial, industrial and speciality ladders consist of stepladders, multipurpose ladders, platform ladders, single ladders and extension ladders. They are light and robust making it very easy to move around. 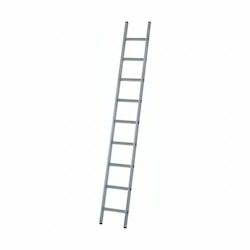 Our ladders are manufactured with either rungs or treads which are riveted or flanged depending on the usage. 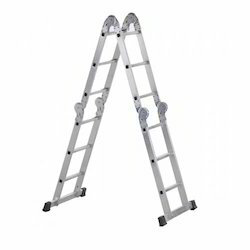 All ladders have slip resistant safety shoes making it extremely stable during ascent or descent. Accessories include sprung swivel/fixed castor wheels, stabilizers, hooks, handrails, tool trays etc. They are available in 2 options – aluminium and fiber glass. 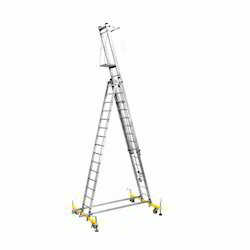 Our stepladders, multipurpose ladders and platform ladders have rigid locking bars which ensure stability when climbing. 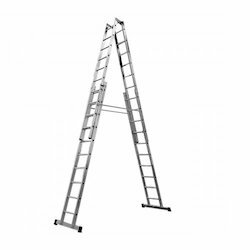 Our extension ladders have an adjustment facility from rung to rung which enables the ladder to be adjusted to the desired height. Once adjusted at the desired height, premium heavy duty rung locks are used to lock the ladder securely. Our speciality ladders are versatile and flexible and have different structural variations which enables them to meet with practically any application. Just a few minor manual adjustments are needed to set them up for different or shifting operating conditions. 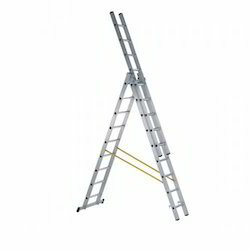 Ladders are primary suitable for short-duration jobs involving low levels of risk and as a means of accessing heights. Particularly suitable for working at great heights. Extremely easy & convenient rung-by-rung height adjustment. Locks securely thanks to automatic spring-loaded pawls. Rungs and stiles made from extruded aluminium section. Replaceable 2-component plastic end caps ensure positioning without risk of slipping and at the same time provide firm seating in the side rail. High strength quality triple formed connection between rungs and stiles. The upper ladder is fitted with end caps. Top section fitted with wall wheels. For push-up ladder: Plastic anti-friction insert in stile-guide and rung-locking mechanism. For rope-operated ladder: Height adjustment with polypropylene rope and pulley. The ideal piece of equipment for working at great heights around electricity. Sturdy aluminium alloy rungs (28 mm x 29 mm) with non-slip serrated surface. High level of protection provided for working on electrical installations thanks to insulated stiles made from glass fibre reinforced plastic. Replaceable 2-component plastic end caps that fit securely in the stile and ensure that the ladder does not slip. 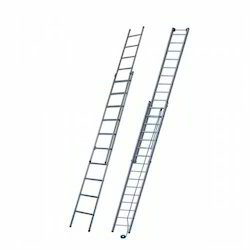 Minimum ladder width: 420 mm & Pitch: 280 mm. Do it yourself" Platform Ladder - opens easily with just one hand. Knee height guardrail for safety. Rails made from aluminium extruded profiles for maximum stability. Wide and comfortable platform with non-slip surface. Front & rear rail strengthened by riveting to each other - no plastic hinges. Wide, deep steps with non-slip surface. Steps strengthened by riveting to rails. Safety straps for model nos. 4525032, 4525034 and 4525037. Very light but still extremely stable – ideal for speedy jobs. Sturdy aluminium alloy rungs (28 mm × 29 mm) with non-slip serrated surface. Robust steel hinges, firmly screwed in place. Two anti-splay, high-strength perlon belts, secured to rung so as to prevent twisting. Additional stability provided by reinforcement to bottom rung. With thorough industry knowledge, we are engaged in manufacturing, supplying and trading a wide range of Height-Adjustable Stepladder with Rungs. Latest machines and advanced technology are employed in the manufacturing process following standards & norms of the industry. Flexible and stable ideally for rapidly changing applications. 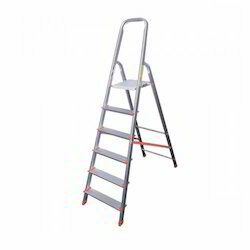 We are the leading manufacturer of Multi Purpose Folding Ladders and our product is made of good quality. Lean-to, trestle & staircase ladder in one. Easy to use, automatic aluminium safety hinge. Only a few actions needed to convert from one to the other. Rung by rung height adjustment in all versions due to four handles of diecast aluminium. Top section with parking hooks and locking mechanism. Strong perlon restraint strap with sewn-in fixing tab. Sturdy, screwed fittings made from extruded section. Optimum guide connection that encompasses the whole stile. Locking mechanism and guides are bolted in so that they can be replaced. Height of top section can be adjusted with a rope. Stiles made from tubular box sections. 400 mm × 400 mm platform made of embossed aluminium alloy. Stable back rest and spacious tool tray. Two stabiliser bars supplied as standard, with polyamide castors (15 mm diameter) and height adjusters. Ladder and support section connected by two braces. Looking for Speciality and Industrial Ladders ?